Nate Boyer (#nateboyer37) bio reads; Freelance relief worker. Green Beret. Texas Longhorn long snapper. NFL hopeful. The backstory on Nate is that he is too old, too small; and too non-traditional for the NFL. The American underdog; the making of a great story. The kind of stuff Hollywood eats up. The media loved Nate’s story; he appeared on ESPN, the NFL Network, he was adopted by FOX Sports NFL insider Jay Glazer and was interviewed by many local, regional and national publications. Nate was very articulate and used his platform to call attention to veteran issues like 22 Kill, which advocates for ex-servicemen and aims to reduce an alarming statistic: an average of 22 veterans per day commit suicide. As a Seattle Seahawks fan, I was drawn to Nate’s story as he was in rookie camp. It was a great story–a 34-year-old (a dinosaur by NFL standards) who attempting to win a spot on one of the best football teams in the world. A legitimate war hero that had joined the Army and was selected as a Green Beret because he found patriotism in Sudan. No Hollywood ending for this would-be pro football player as Nate was cut during the preseason. End of story. So what makes the Nate Boyer’s of this world tick? Why do some people transcend the norm? I have noticed several traits that Nate shares with other outliers of the status quo. Called to a higher purpose. Nate describes his calling in this manner; then Time published the article “The Tragedy of Sudan.” It electrocuted my soul. I was captivated by the pain and atrocity of the genocide. James Nachtwey’s (#JamesNachtwey) photographs made me ache inside like I never had before. Demand excellence of themselves. Nate wrote: I think everyone has the capacity for greatness. It’s just a matter of whether you’re willing to make the necessary sacrifices to achieve great things. There is literally nothing special about me. I’m a good athlete, not a great one. I’m smart, but I’m no genius. I can figure things out, but I’m not a fast learner. All I do is make the choice to outwork everyone around me. That doesn’t take a special person; it just takes ambition, effort and commitment. Overcame fear of rejection or failure. Nate’s mantra is; I think you should try things. Everyone should spend an extended period of time outside his or her comfort zone. There is much more to life waiting for you beyond the bubble you’re living. We all forget this on a daily basis, and it’s not our fault, just a byproduct of the culture. The world is waiting for you to get involved. If you don’t know what you like or what drives you, then just try things. You’ll find passion if you’re seeking it. Disruptive thinkers. Nate recommends challenging ourselves; the biggest obstacle that stops us from achieving our dreams is placing additional limits on ourselves. Why would we do that? Why make things harder than they already are? I didn’t always look at things like this. I had to run away from what was familiar and comfortable. I had to take a long, hard look in the mirror and make the decision to change the way I attacked life. For me, it took a journey to a place I knew nothing about. It took a trip to the Darfur. Nate’s story makes me feel better about the human condition. That is until I look in a mirror and filter my life by his deeds. When I think about a persistent twenty something that wanted to go to the Sudan to serve a desperate people, I feel like I need to do more. When I think about that twenty-something that refuses to take no for an answer, I feel like I gave up too easily on some dreams. When I think about a twenty-something that discovers his patriotism in a foreign land, I feel like I have taken my country for granted. Perhaps that is why God created people like Nate—to challenge us to live differently and more fully. Overachiever. Disruptor. Inspiration. Leader. Veteran. Hero. 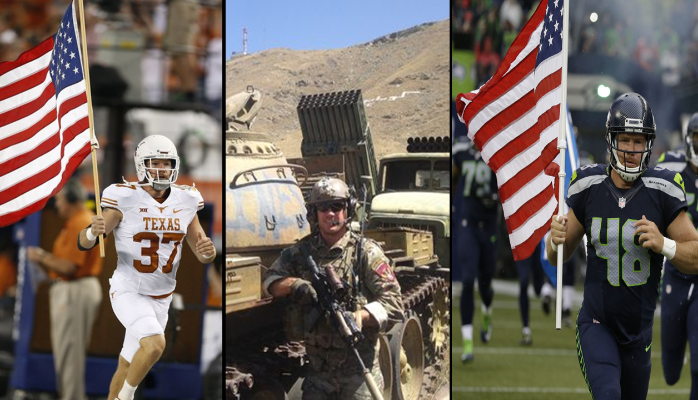 A lot of words can be used to describe Nate Boyer. But if Nate is like most military veterans, he will tell you the real heroes are the men and women who make the ultimate sacrifice or the ones who returned home with additional challenges to overcome. So, what is Nate up to now? His latest adventure is called Conquering Kili, he is teaming with another veteran, Blake Watson (@BlakeWatson24) to continue their service in the third world; now instead of fighting for their freedom, these veterans are fighting for the right for communities in East Africa to have access to clean water. As we celebrate Veterans Day this year, perhaps we can join Nate in this effort and donate to this cause? By Marvin E. Smith in Talent Community Creation and Development on November 9, 2015 .